One of our demo gardeners emailed me after last week’s workday to say she’d come down with an irritating rash on her forearms. She wondered if she’d found some poison ivy (which is possible) but also said she’d spent much of her time at the garden searching out and crushing squash bugs and their eggs. This sounded kind of familiar from some of my gardening experiences, and I did a little searching around and found that, yes, the hairy leaves of squash can cause dermatitis in sensitive individuals. As can quite a number of other plants, in and out of the vegetable garden. Among the primary vegetable suspects are tomato, cucumber, garlic, peppers, spinach, okra, and members of the cabbage family. Parsnips and other carrot family members can cause photodermatitis, a reaction that involves sunlight. A long list of potential irritants, and definitions for the different sorts of allergic and non-allergic reactions, can be found here (PDF file). This is not intended as medical advice so PLEASE call your doctor if you get a rash and it’s bothering you. And take appropriate precautions (gloves, long sleeves) the next time you encounter the suspect plant. Most reactions are not serious – I wouldn’t want anyone to be scared away from gardening! – but even if it’s only a minor rash you don’t want to be bothered with it more than once. I’ve had a lot of itches myself this season (the heat doesn’t help in the least) – will spare you photos but since my mom reads this I’ll just tell her, Mom, I sure have the Chandler legs this summer! 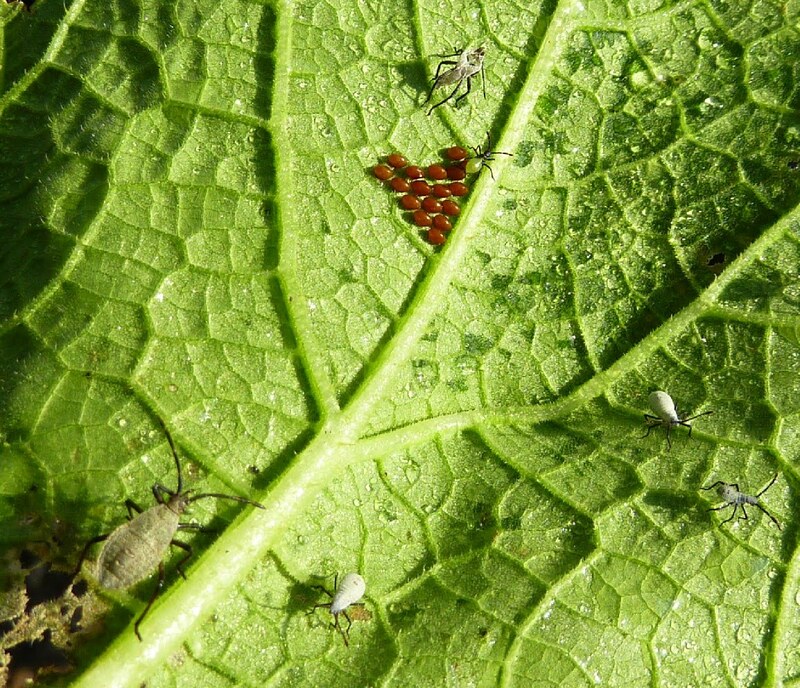 Here’s a more interesting photo: some of the squash bug eggs and different stages of nymph, so you know what to crush if you see them on your plants. Just make sure you wear gloves! great post! there are definitely lots of irritants and for me, wearing gloves is a must. I had an experience with poison ivy that was horrendous and I'm once bitten twice shy. I also tend to avoid the undersides of leaves. Not smart since you're able to squash eggs of pests and I deal with eaten up leaves and veggies, but I guess I'm a bit of a garden wuss. I think you just have to find the level of plant contact that works for you. Some people are more sensitive than others – I get a rash from squash but it vanishes after a few minutes. But poison ivy, watch out!